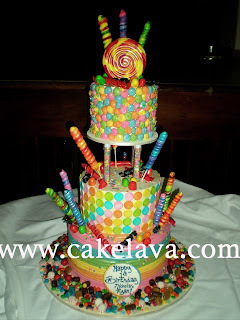 cakelava: Now that's a candy cake! Now that's a candy cake! Another busy week behind us. One of yesterday's events was for Nicholas' 1st Birthday party. The theme of the party was CANDY and lots of it! From the 3-tier custom designed all-edible candy themed cake Rick created to the candy bar stocked with goodies, and the centerpieces, candy was everywhere. Even the giant inflatable bouncy had pictures of candy bars on them. I can't even begin to imagine how hyped up the kids must have been by the time the party was over. Yikes! For the candy cake, they chose our Bananarama flavor -- banana cake with fresh bananas, caramel cream and chocolate ganache. We hope Nicholas and all his guests had a fun and memorable 1st birthday. It was a sweet beginning for an adorable boy! See this cake and many more new cakes as well as our next Featured Wedding on cakelava.com in the near future. Hey DJ, Play That Song! All Hail the Great White Snark! The Bride & Bloom Magazine!